From the moment he started teaching 10 years ago, Gary Kayye knew the traditional classroom was a poor fit for his tech-savvy students. Gary is an assistant professor in the School of Media and Journalism at the University of North Carolina (UNC) at Chapel Hill. Over the years, he tried many times to move beyond static lectures by enriching the classroom experience with digital collaboration and presentation tools. But virtually every effort proved to be a challenge. Then the university asked him to design his dream classroom, and that changed everything for him and his students. “We’ve finally built a classroom where we can teach them in the same way that they learn,” says Gary. The first thing that struck Gary when he stepped back into the classroom was how little things had changed since he was a student 25 years earlier. Students still sat passively at their desks taking notes while professors presented lessons at the front of the room. 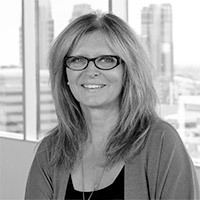 As an audiovisual technology expert and CEO and founder of one of the industry’s leading online media properties, Gary stays on top of all the latest technology trends and knew exactly what was needed to make both the teaching and learning experiences more dynamic. But every time he tried incorporating a new digital tool into his teaching, he always faced challenges: Internet connectivity was unreliable, and the process felt “clunky” because he often had to open and close multiple applications during a lesson. What he really needed was a fully integrated collaborative classroom where he and his students could instantly access digital content and everyone could interact naturally whether they were in the same room or not. Gary teaches several courses at the journalism school, and all of them involve group projects. 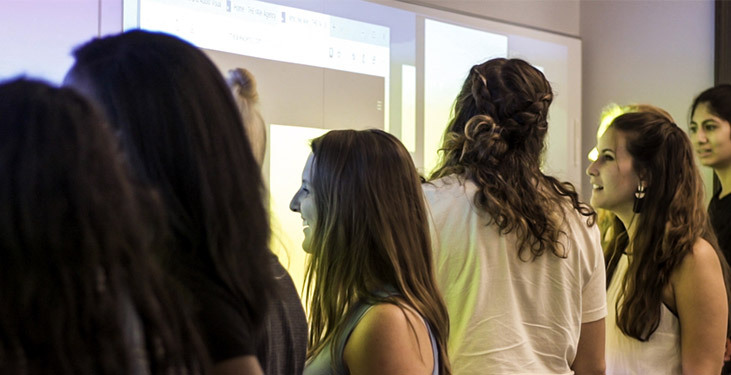 So, another must-have component of the new classroom was a collaboration area with a large interactive surface that student groups could use to work together and interact with large amounts of digital content. He wasn’t entirely sure how to pull that off until he saw Nureva visual collaboration solutions. “When I saw the Nureva system, it was one of those light bulb moments when I realized how I could bring that kind of full-scale into my classroom,” says Gary. He says Nureva technology also overcomes one of the big challenges with group work: keeping everyone on the same page. It’s often difficult for people to stay aligned because they can interpret content in different ways, and it’s hard to get everyone in the same room at the same time. All of that makes it easy for a group project to go off track. “The Nureva system solves both of those problems because you can document everything that you do and share it with everyone and have access to it all the time,” explains Gary. The collaboration process is also more efficient. 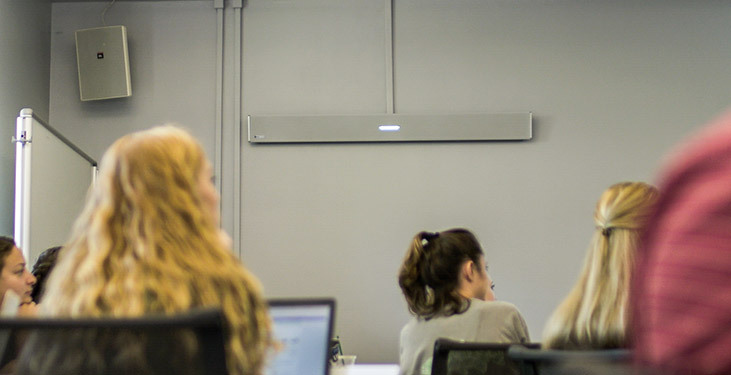 In the past, when students wanted to share content, they had to come to the front of the room and connect their laptops to the projector so it could be displayed. Now, they can do that from anywhere in the room using Span Workspace. In fact, they don’t even have to be in the same room to collaborate because the experience is the same for students connecting remotely. Sound quality was another thing Gary knew he had to get right. He spends a lot of time on the road attending technology trade shows and conferences, and rather than cancel classes every time he’s away, he teaches remotely. So, the audio equipment in the new space had to provide a high-quality sound experience for participants whether they were in the classroom or not. He also live streams and records all of his classes and wanted the sound to be picked up from anywhere in the room so all students’ questions and comments could be clearly heard. The initial plan was to have the professor wear a microphone, place area mics around the room and then feed everything into an audio mixer. But that option was going to be expensive and complicated. The process was rife with potential problems, from maintenance issues like keeping batteries charged to technical challenges like mixing audio sources. In the new classroom, the HDL300 system is on all the time and is a core element of everything Gary and his students do during a class. With its 8,192 virtual microphones, the system picks up his voice at the front of the room and all questions or comments from students no matter where they’re sitting. And when students break into groups, those conversations are captured, too. This ensures students can have the same natural experience even if they have to miss class and watch the online live stream or recording instead. 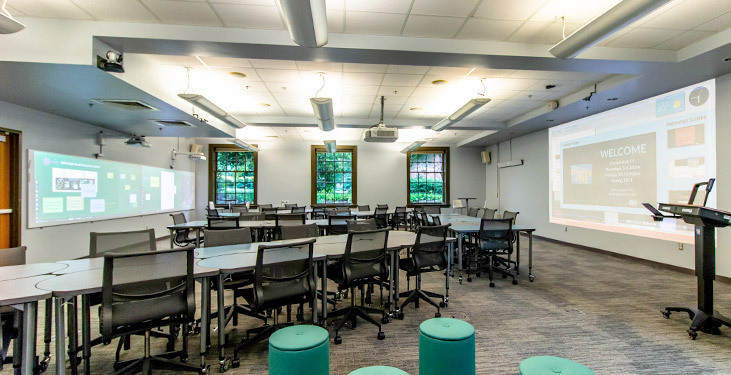 The official name of the university’s new learning space is the Reese News Lab Collaborative Classroom of the Future, which Gary says is somewhat ironic since the “futuristic” classroom has really just caught up to the reality of today’s learners. And he thinks this is just the beginning and that high-tech active learning classrooms like these will soon be commonplace on university campuses everywhere. He says so far, response to the new collaborative classroom has been “astounding.” In fact, it’s already inspiring similar spaces on the UNC campus. This fall, construction will start on a new journalism school building with eight classrooms designed for digital collaboration. The rooms will be modeled after the classroom Gary designed and equipped with the same powerful digital tools that are now helping him and his fellow professors rethink their teaching and make it a better fit for the way today’s students learn. Explore Gary's active learning space and all its technology solutions with this VR tour. 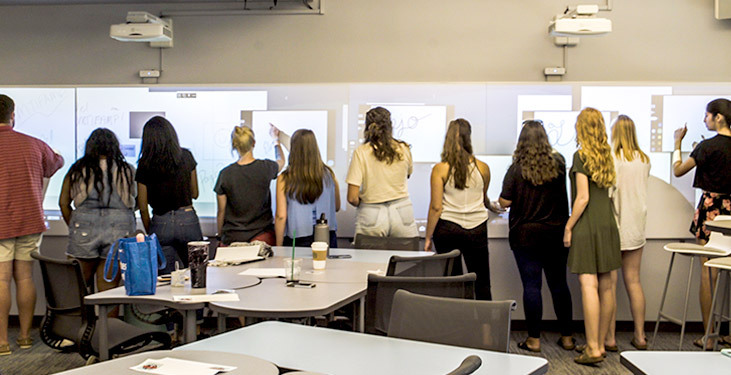 Find out more about the Nureva products that play a key role in the University of North Carolina's collaborative classroom.